Tropical Storm Claudette was on course late Sunday afternoon to hit the Florida Panhandle in the evening, and the storm’s outer rain bands already were pushing into the area. At 5 p.m. ET, the center of Claudette, with maximum sustained winds near 50 mph, was in the Gulf of Mexico about 40 miles west-southwest of Apalachicola, Florida, and about 120 miles southeast of Pensacola, the National Hurricane Center said. It was moving northwest at about 14 mph. 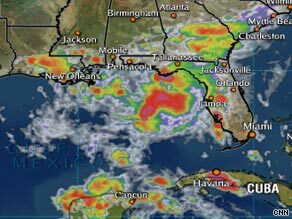 A tropical storm warning was in effect from the Alabama-Florida border east to the Suwannee River. A tropical storm warning means that tropical storm conditions are expected in the warning area in the next 24 hours. The storm could bring 3 to 6 inches of rain, with isolated amounts up to 10 inches, across portions of the Florida Panhandle, central and southern Alabama and extreme southwestern Georgia. Storm surges also were possible across portions of North Florida. Meanwhile, two other severe storms were in the Atlantic Ocean on Sunday. Tropical Depression Ana, which was downgraded from a tropical storm Sunday afternoon, was losing strength as it approached the Northern Leeward Islands, while Tropical Storm Bill was gaining strength as it followed behind Ana. iReport.com: Are you in Claudette’s path Ana was about 170 miles (270 kilometers) east of Dominica at 5 p.m. ET Sunday. It was expected to arrive at the Leeward Islands by late Sunday and enter the northeastern Caribbean Sea on Monday, the center said. It was moving east at 23 mph, and its maximum sustained winds were close to 35 mph, the center said. Tropical storm watches were in effect for Puerto Rico, the U.S. Virgin Islands, the British Virgin Islands, Montserrat, Antigua, Barbuda, St. Kitts, Nevis, Anguilla, St. Maarten, Saba, St. Eustatius, Guadeloupe, St. Martin, St. Barthelemey, and parts of the Dominican Republic. Tropical Storm Bill — which could become a hurricane on Sunday night or Monday — was in the Atlantic heading west-northwest. The storm was 1,440 miles east of the Lesser Antilles at 5 p.m. ET Sunday. Storm Fallout: A Florida Exodus?